As we all love a good debate on this site I thought it might be handy for us to have an idea of some of the tactics we all often use (mostly unintentionaly) to try to win a debate, but which aren’t actually useful at all, and in fact do not prove our points one little bit. Logical fallacies keep us thinking we have arrived at the truth when in reality we have done no such thing. This page and its contents will hopefully help each of us recognise logical fallacies in others arguements as well as our own and help us to be rigorous in presentating our arguments and premises. This is the brilliant site, that contains an encyclopaedia of Logical Fallacies or you can click on the image below to view a great graphic depicting the a good, albeit smaller list. From here on in, whenever we see a logical falacy in peoples arguments we can look up that fallacy HERE and provide the poor delusoinal thinker with a link to thinky awesomeness! What about a Biblical fallacy? Does that count? I think the link to the site with excellent observations about logical fallacies is likely to keep many at bay. Those who would rather go have a good old dirty argument somewhere without being spotlighted in that way, so no great loss but like my site it does seem unnaturally quiet round here…. I’m new to this whole blog experience..how do I leave comments on peeps blogs? 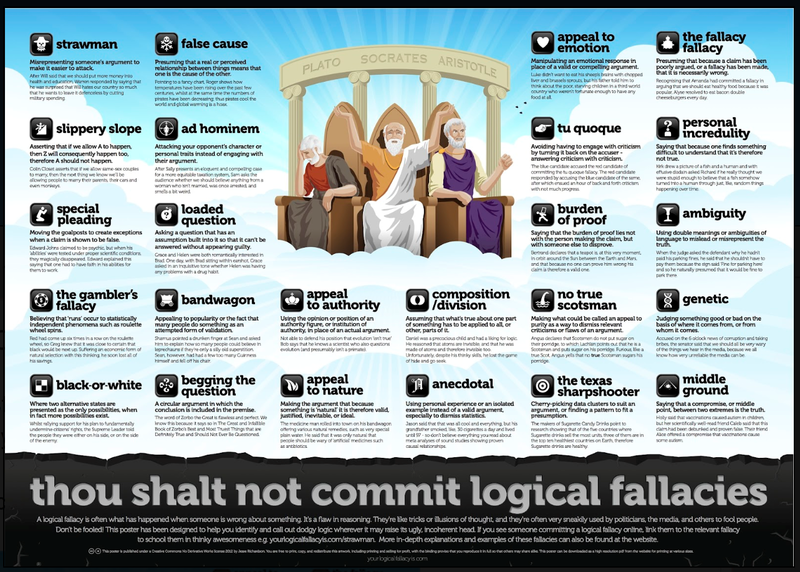 I love the “logical fallacies” graphic, it puts a name to everything I can’t stand about social interactions. In a nutshell, it’s saying if you can cut out all this bullish*t, you may just have an honest, intelligent debate or conversation. Having said that, I’ve got to be honest, I found your blog through your post on marriage, and I wasn’t pleased. Granted, pleasing me isn’t your job, but since you’re supposedly a Christian, I sort of assumed we both answered to the Highest Power, which is why your stance on marriage surprised me. I read one comment where you used the phrase “liberal Christian” which sounds a lot like “vegetarian beef”, “hot ice”, “dairy-free milk”, etc. It makes no sense. I have a point, so bare with me as I make it. I believe that not a single soul will die without ever having a chance to be saved–even if they’ve never read the Bible or heard the salvation message. I believe that because “the heavens declare the glory of God and the earth shows His handiwork”, the world and everything on it lays testament to it’s Creator and God isn’t limited in His ability to reach mankind wherever we are. But, having the Bible certainly gives us an advantage because it’s the inspired Word of God. And even though salvation is certainly attainable without having the Bible, it’s far easier to get to know God if you have His Word. For example, if a relationship with God is the destination, then the Bible is the map. You can reach that destination without the map, but naturally, having the map certainly aides us in making the journey. If we don’t believe that the Bible is the inspired Word, then everything I just said is false and even the foundations of the Christian faith are false. Simply put, you can’t be a Christian if you don’t believe in God’s Inspired Word. You can be a Christian without ever reading His Word because you never had access to a written copy, but because you came to salvation through His creation’s song, you have unknowingly put your faith in the same God that every Christian has come to know through His Word. If you are truly a Christian, then you’ve made the decision to put your faith and trust in Christ as defined by the Bible. You believe with all your heart the promise God made through His Word. But if that promise of salvation is true, then it’s all true. If one part if the Bible is a lie, then it’s all a lie. Christians are those who believe the Word is the truth. Which means we know what God defines as moral or immoral, holy or abominable, right or wrong. The Bible leaves no room for liberal thinking. There are very few actions or behaviours that aren’t specifically addressed in the Bible, but yes, there are a few. And for those few, we, as Christians, need to pray for guidance and discernment in those areas and make our decision based on the Holy Spirit’s guidance in our lives. But the sacrament of marriage and the abomination of homosexuality are NOT examples of these few “unknowns” not specifically addressed in the Bible. In fact, both acts are discussed on many occasions and God’s direction in regards to them are very clear. So to say you’re a “liberal Christian” in regards to homosexuality and gay marriage is to put lipstick on a pig, and defines the “lukewarm” behavior that God despises. As a Christian, I am to love people like Christ loved them. But I am not supposed to tolerate sin in any form. I can love the individual without tolerating or excusing their actions. I have made my fair share of whoppers when it comes to sin, but I don’t hate myself for it and I hope no one else hates me either. Having said that, I hate some of the things I’ve done and I would never try to excuse or condone my mistakes when I know in my heart it was wrong. We should all be tolerant of people, but Christians should NEVER be tolerant of sin and especially not condone it. All that to say, you can be a liberal or you can be a Christian, but you’ll never meet a liberal who’s truly a Christian or a Christian who’s truly a liberal. Just like you’ll never eat hamburger that’s truly made of vegetables. That doesn’t mean people won’t try and change the definitions to suit their personal inclinations but in truth, those opposites will never and could never coexist. My advice as a Christian who genuinely wants God’s plan for your life would be for you to do some serious soul searching and prayer, because you seem to be living a gigantic contradiction and that worries me.